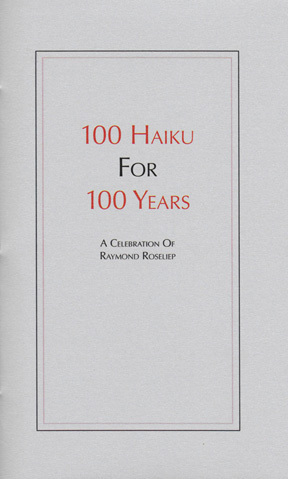 Brooks Books is pleased to announce the publication of 100 Haiku for 100 Years: A Celebration of Raymond Roseliep. Randy and Shirley Brooks, Editors, have selected 100 favorite haiku for this commemorative collection. Many of these haiku by Raymond Roseliep have appeared in multiple journals and poetry anthologies. This edition is limited to 100 numbered copies, hand-sewn with pearlized cream paper and pearlized silver cover. It was released on August 11, 2017 at the 100th Birth Anniversary of Rev. 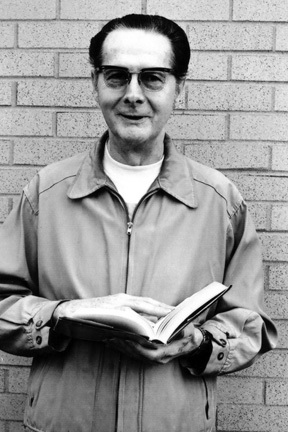 Raymond Roseliep at Loras College in Dubuque, Iowa. A copy of 100 Haiku for 100 Years is $12.00 plus $3.00 for shipping and handling. The easiest way to order your copy is through our Paypal link. However, if you wish to order a copy by snail mail, make your check out to Brooks Books. 100 Haiku for 100 Years is a preview of the forthcoming Collected Haiku of Raymond Roseliep to be published in a cloth-bound library edition by Brooks Books later this year. Raymond Roseliep was a poet and contemporary master of the English haiku and a Catholic priest. He was born on 11 August 1917, in Farley, Iowa. In 1939 he graduated from Loras College with a Bachelor of Arts, in 1948 he received a Master of Arts in English from Catholic University of America, and in 1954 he received a Doctor of Philosophy in English Literature from Notre Dame University. He was ordained on 12 June 1943 at St. Raphael’s Cathedral, Dubuque, Iowa. During the mid-50’s Raymond Roseliep began writing poetry that is less that of a “Catholic priest” and more secular in nature. Widely published and recognized as a master of traditional English verse forms, in 1960 Roseliep began writing haiku, at first in the traditional 5-7-5 form, then in more experimental ways. His first book The Linen Bands was published by The Newman Press in 1961. Roseliep published over twenty books, including Rabbit in the Moon, Step on the Rain, The Still Point, Light Footsteps, and Firefly in the Eyecup. In 1964 he was the Poet-in-residence at Georgetown University. In addition to the major haiku journals which published his work regularly, more than ninety other magazines have printed his haiku, and he appears in many anthologies and in a growing number of textbooks. His haiku attracted critical praise from such poets as W.H. Auden, Josephine Jacobsen, Denise Levertov, William Stafford, X.J. Kennedy, and A.R. Ammons. In 1982 he was appointed Professor Emeritus at Loras College. Father Raymond Roseliep died on 6 December 1983 of an aneurysm. Biography from The Living Haiku Anthology. An excerpt from Raymond Roseliep’s “This Haiku of Ours,” published as a letter to the editors in Bonsai: A Quarterly of Haiku in 1976, pages 11-20. Since 1963 I've been working with haiku—reading Japanese haiku of all ages in translation as well as varieties of haiku by American and English writers, studying articles and books about this exquisite formation, and of course writing haiku, ranging from classical /traditional on through vastly experimental kinds. Although my theory and practice are both in a healthy state of flux, I'd like to set down some of my present thought. Marveling at how we've done splendid, audacious things with the sonnet in transporting it from Italian shores into the mainstream of our poetry, I'm heartened to reflect on possibilities for haiku. I believe we are preserving the quintessence of haiku if we do what the earliest practitioners did: use it to express our own culture, our own spirit, our own enlightened experience, putting to service the riches of our land and language, summoning the dexterity of Western writing tools. The most obvious way we can begin to make haiku more our property is to exploit our fabulous native tongue. English can be as musical as only a poet knowing the keyboard can make it, or as cacophonous as he may wish to make it too. Within our miraculous sound system we have cadences, rhythms, measures, movements, stops, pauses, rimes (!). We possess a gigantic vocabulary—and oh what we can do with words when we arrange them! Since phrasing is vital to haiku, our supple American idiom stands ready for achieving any effect desired, and waits only the hand of the poet to manage it. For subject matter we should dig into our own teeming country, God's plenty when it comes to materials: outer space discoveries, hairy youth, mini-skirts, bell bottoms, roller skates, pizza, peanut butter, saucer sleds, circuses, our enormous bird-fish-animal-&-insect kingdoms, our homeland flowers-trees-plants-grains-vegetables-&-fruits, motorcycles, ships that plow the sky and deliver people to Japan—the storehouse is without walls. Practically everything under the sun is valid subject matter for haiku as for any poem, except that in haiku it is the affinity between the world of physical nature and the world of human nature that concerns us. and so we focus our images there. It's American images I'm advocating rather than the Japanese cherry blossoms, kimonos, rice, tea, temple bells, Buddhas, fans, and parasols that populate so many supposedly Western haiku; something is not quite right when our poems come out sounding like Eastern poems. Creation is still more exciting than imitation.